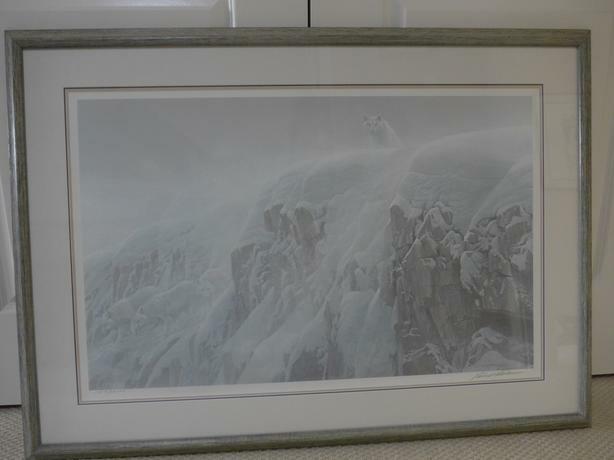 Robert Bateman - Arctic Cliff - White Wolves Release Year: 1991 Size: 20.25 x 32.5. Framed size : 30 1/2" x 42.5" Triple matted and professionally framed. Form: limited edition print on paper Edition Size: 13000 numbered and hand signed by the artist. Includes Certificate of Authenticity. The wolves in this work have been arranged to induce the excitement of discovery. You and the wolf on the top of the cliff first discover and observe each other. A moment later, you realize that there are other wolves, making their way down to the bottom of the cliff - to your level - and that they too are aware of you.